Establishment of documentation of software installed on machine / equipment are managed for recording and improvement awareness and utilization. Establishment of documentation of software installed on various locations where machinery and equipment installed are conducting to recording purpose and gathering all information, records and data for improvement, awareness and utilization of machinery and equipment to support of software installed. The Software installation on the machinery / equipment are used to supporting the functions of machinery and equipment, monitoring and controls over the machinery and equipment functions and managing production lines by limited manpower, and with systematical ways. The software installations and its utilization are managed generally for auto job, monitoring systems and controls on the various functions, setting up parameters of machinery / equipment are used in production lines and supporting to manufacturing activities that is important part of the manufacturing unit. 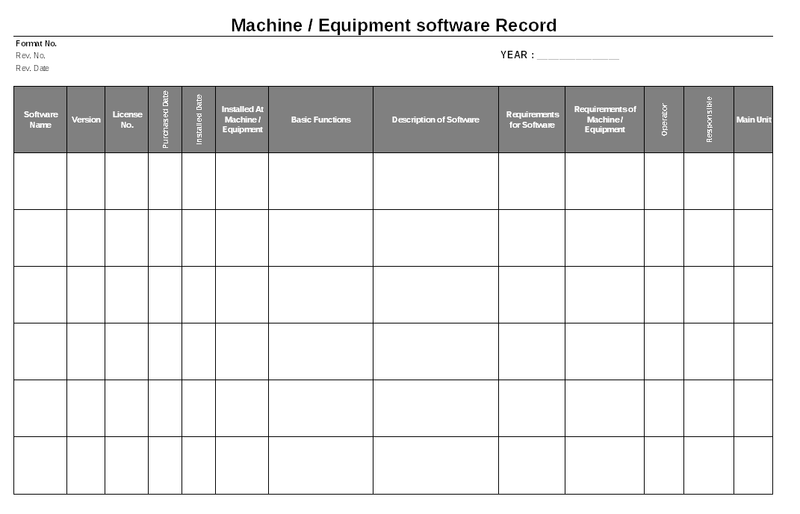 Machine / equipment software records are managed by department head or head of information technology to managing records where individual machine / equipment are installed and running at various locations, the records are managed and update as per new installation and modification, update of software versions and modification of functions in software.